One Lunch Lady's Cafeteria Conversion : The Salt "If it's not me, who's it going to be?" asks Colorado school cafeteria manager Kathy Del Tonto. After serving processed foods in her cafeterias for years, she realized that reducing childhood obesity can begin with her. She now has the lunch ladies making 95 percent of meals from scratch. 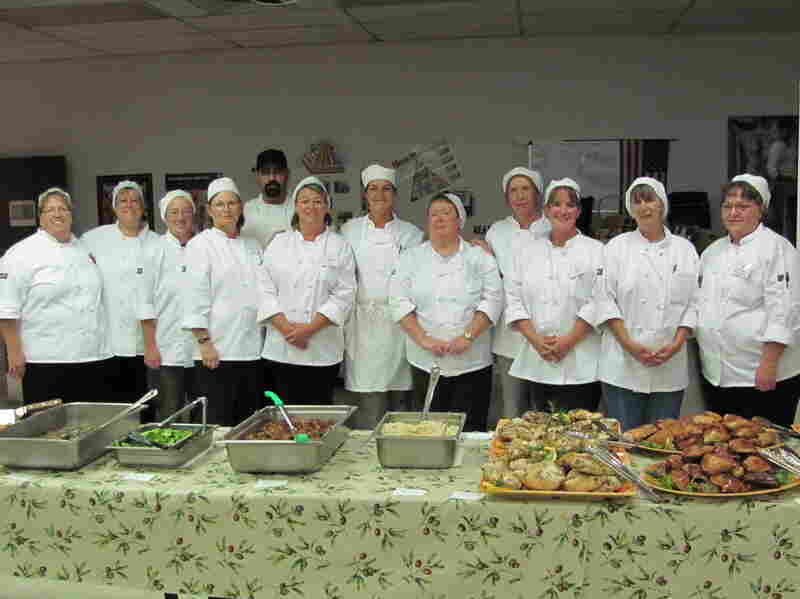 Kathy Del Tonto (far right) participates in a class that teaches school cafeteria workers how to prepare meals from scratch. But times changed. Families started eating more fast food, and processing companies started offering schools fast-food kinds of choices. The companies would take the food that the U.S. Department of Agriculture gives to schools, turn it into chicken nuggets and other processed items kids want, and then send it to cafeterias — for less than cooking it on site would cost. Del Tonto went along with it. "By doing processed food you can cut your labor because you don't have to do the hard cooking, or you're just reheating and that kind of thing," she explains. Increasingly, though, the movement to reduce childhood obesity by improving what kids eat in school has changed the game. It means schools are now required to serve more fresh fruits and vegetables. And there's a movement within the movement that promotes the retro notion of cooking meals from scratch. And that takes a change in the hearts and minds of those behind the lunch line. Mike Shethar, a chef from Boulder, Colo., wants Del Tonto and all other cafeteria workers onboard. He says with a little training, food staff can cook the food on site. "I ask them if they cook chicken at home and they're like, 'Of course I cook chicken at home,' and I say, 'Is it difficult?' 'No, I do it all the time,' " says Shethar. "And so I think about transferring the love you give your food at home — why shouldn't it be in the schools?" Despite the rap that it's more expensive to cook, Shethar believes it can be done for the same price as having the food processors do it. Shethar travels around Colorado with a group called LiveWell Colorado, which teaches districts like Del Tonto's how to switch to more healthful food. Think of it as a boot camp for the lunch lady set. At first, Del Tonto was not pleased. "I didn't like somebody coming in and telling me I was doing it wrong. We were giving kids what they loved. We had huge lunch counts; they were happy. Nobody was complaining," she says. That was two years ago. Del Tonto was in charge of food for all 11 schools in her district, and she had them serving processed foods almost exclusively. But by the end of the school food training, she was a changed woman. "When I sat there in that classroom and knew the obesity rate had increased 30 percent, when I saw photos of kids and knowing that that generation doesn't have the life expectancy that their parents [have] — as a mom, that's a shock-and-awe moment," she says. "I remember thinking in my head, if it's not me, who's it gonna be that's going to take that on? And if not now, when?" Two years later, Del Tonto's schools have switched from mostly processed foods to making 95 percent of what kids eat from scratch. But it wasn't easy. It required training staff members, educating them about healthful eating, and lots of repetition to get the kids to make the more healthful choices. Those challenges, and others, are more than most schools want to take on, says Joe Pawlak, a school food industry analyst. It takes money, new equipment and retraining cafeteria staff. Del Tonto's school had financial help. Del Tonto remains committed to serving nearly all meals in her schools cooked from scratch. She says lunch ladies feel better serving things they've made themselves. "Just knowing the love and the care we put in that food, hoping that it makes a difference for some of those kids." This story is a partnership between NPR, Colorado Public Radio and Kaiser Health News.